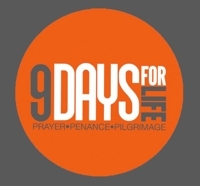 For the second consecutive year, the U.S. Catholic bishops are sponsoring Nine Days for Life: Prayer, Penance and Pilgrimage, planned for Jan. 18-26, as part of several events marking the 41st anniversary of the Roe v. Wade decision legalizing abortion virtually on demand in the U.S.
“Since that tragic decision, more than 55 million children’s lives have been lost to abortion, and many suffer that loss — often in silence,” said a posting at 9daysforlife.com. Sign up to receive a simple daily novena with different intercessions, brief reflections and suggested acts of reparation at 9daysforlife.com. The Nine Days for Life website offers several ways to sign up to receive a simple daily novena with different intercessions, brief reflections and suggested acts of reparation via e-mail or text message, or by using an app for smartphones. Several resources for prayer and activities — as well as the full reflections for each of the nine days — are available online in the “Pro-Life Activities” section of the U.S. bishops’ website, http://www.usccb.org. On Jan. 22, the anniversary of the 1973 Roe decision, the National Mall in Washington, D.C., will again be the site of the annual March for Life. Thousands of pro-lifers are expected to descend on the Capitol for the rally and march to the Supreme Court. A pre-rally event with live music beginning at 11:30 a.m. will be followed by a noon rally. The march begins immediately afterward, with participants walking from the Mall to Constitution Avenue and ending up at the U.S. Supreme Court.